An “Open Mic” is an event at which anyone is welcome to take to the stage and perform. Songs, poems, tunes, stories and all sorts of performances are welcome. This is the second of three Cross Border Open Mics happening as part of The Glens Centre’s Across the Lines programme in a cross-border collaboration between Enniskillen based “The Thing Itself” and “Open Mic Manor”. Borders have inspired a wealth of works in word and music, much of which speaks of attachment to place, people, loss, love and life. 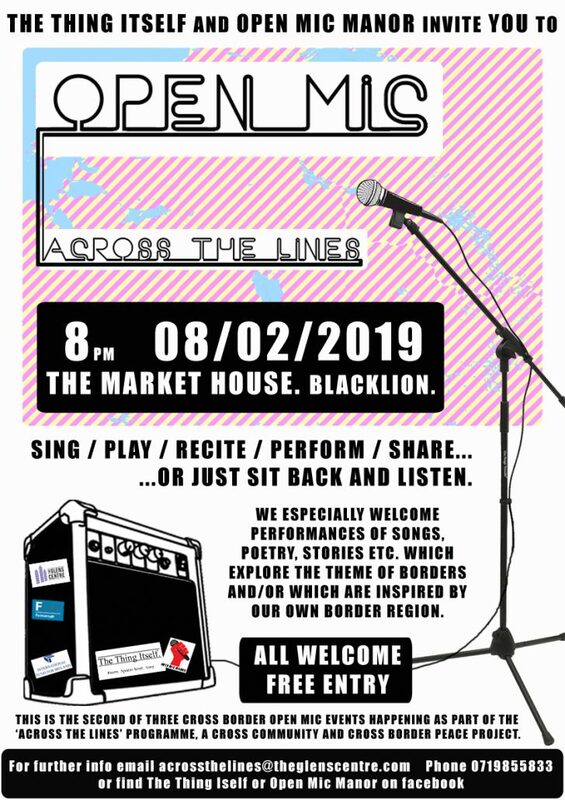 On the night, we particularly welcome performances inspired by or connected to the theme of ‘border’, crossing borders and connecting beyond or in spite of! We hope that this Open Mic will bring a whole range of individuals and acts from the region into the limelight and performers can make new connections and development an awareness of each other’s work. There’s no pressure to perform, so feel free to just come along and listen. The “Across the Lines” programme fosters connections and community spirit in the Fermanagh and Leitrim and across our regional borderlands, an area rich with culture and creativity. A final Cross Border Open Mic event will take place in The Glens Centre on Sat 13th April 2019. Next postFinish off February with Honor Heffernan, Jazz Guitarist Mike Nielsen & a hilarious production of ‘Don’t Tell the Wife’!